Suriya's upcoming film 24 is directed by Vikram Kumar who is known for his interesting palette of films such as Yaavarum Nalam and Manam (Telugu). 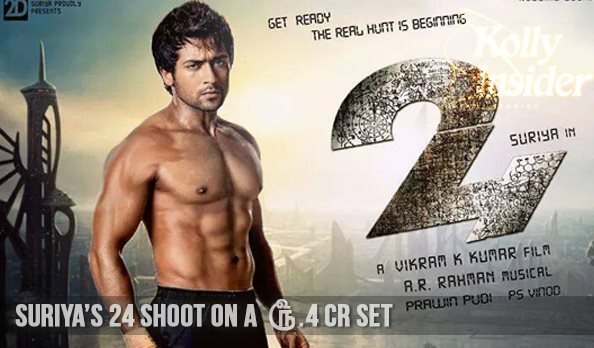 If sources are to believed, Suriya’s 24 will get shooting early next month at Mumbai. According to sources, a grand set worth Rs 4 cr has been erected in Mumbai for Suriya's 24 and major part of the long first schedule shooting will be happening here. Sources say that the team is planning to kick start the first schedule by the end of March and Suriya will be completing Masss soon. Currently a song is being shot on lead pair at Mohan studio. Directed by Vikram K Kumar of 13 B (Yaavarum Nalam) and Manam fame, 24 has Samantha playing the female lead and AR Rahman is the music composer. AR Rahman has already composed a song for this film which has come out very well. The film is produced under Suriya’s home banner, 2D Entertainments and has Samantha playing the female lead. Catherine Tresa is in contention for the other female lead. 24 is touted to be an action adventure with science fiction elements and Kiran Deohans will be handling the cinematography.